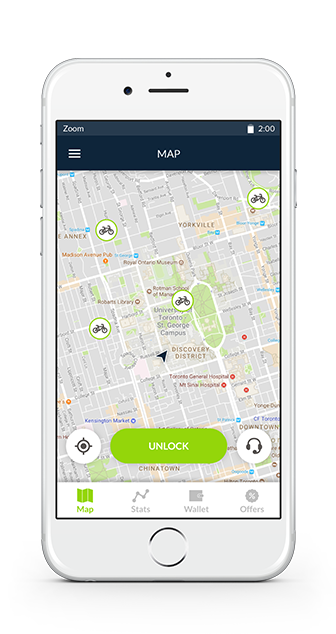 Download the Zoom BikeShare App and find a bike nearby. End your rental in the App and lock to the rack. Download Zoom BikeShare App on your phone. We love bikes and showing people our beautiful area! Zoom BikeShare is provided through Zoom Leisure Bikes, a locally owned and operated bike business in Niagara on the Lake. We have been providing high quality Rentals, Tours and Repairs to Niagara for more than 20 years. Zoom BikeShare encourages seeing Niagara by bike! Our area offers great bike paths that are separate from traffic, popular wine tours and breweries and great fruit markets. You can cycle past Niagara Falls, visit the botanical gardens or Butterfly Conservatory and picnic in the park! Bikes can be rented from any Zoom Location and returned to a different one for extra cost. The clean green way to see Niagara! Our Zoom Team works hard to keep our fleet in the best shape so you can enjoy a carefree ride on our bikes. We a locally based, offer local phone service from 8am-8pm daily and have roadside assistance if you have a mechanical issue. Our bike share system is App based, and not reliant on a “docking” station, a new development in bike share. Our bikes and App are smart! +- What is Zoom BikeShare? Zoom BikeShare is a network of bikes, available for rent to explore our beautiful region. Zoom BikeShare is used by locals and visitors. It allows people to see the area and appreciate it in a way that cars and buses don’t allow. It provides freedom to use the bikes whenever you want and return them to any Zoom BikeShare drop-off you want. Zoom BikeShare is located at area hotels, on bike paths and at other popular areas in Niagara-on-the-Lake and Niagara Falls. The bikes can be rented and returned to any of our designated drop- off locations, allowing you to create your own experience. For instance – if you’re a visitor to Niagara, you might choose to rent your bike from Niagara Falls, ride to Niagara-on-the-Lake along the Niagara Parkway. If you’re a local resident, you might take a bike out for a morning ride each day for some exercise and fun! Zoom BikeShare fully functions through our App. Download the Zoom BikeShare app to your mobile phone from the App/ Play Store. Register by creating an account. Search for available bikes using the map. Either scan the QR code on the bike or enter the number located on the bike and unlock. The lock, mounted by the back tire, will open. If you have not added funds to your "wallet" in the APP you will be prompted to do so prior to the lock releasing. Remove the cable from the open lock. TAKE A BREAK! Pause your ride. Want to stop for some sight-seeing or grab a bite to eat and take a break without ending your rental? Select the Pause Ride option on the app screen. To lock the bike, slide the locking mechanism closed manually. To end your break, just end your break, unlock using the app. Keep on riding! *Note: billing continues during breaks. Return your bike to any Zoom BikeShare drop off in order to end your rental. Select the bike you would like to return from your Rentals list in the app. Select ‘End rental.’ To lock the bike secure the cable loop in the bike lock near the rear tire. Slide the lock closed when ready. Your rental will end and the bike will become available for others to use. Note: The bike is not considered returned unless it is at a designated Zoom BikeShare drop off location. If you choose to end a rental away from a designated station, pick up charges will apply and your rental will continue until returned to a Zoom Location. +- Who can use Zoom BikeShare? Is there a minimum age? Both visitors to Niagara and local residents can rent from Zoom BikeShare. Minimum user age is 16. Riders under 18 years of age must have parental permission. Ontario Legislation does not require helmets for riders over the age of 18. Riders aged 16 and 17 must wear a helmet by law. We recommend you bring your own helmet, follow all the rules of the road and behave in a safe and courteous manner. Zoom BikeShare does not provide helmets at our stations. Our full service bike rental and tour operation, Zoom Leisure Bikes offers helmet rentals and sales located at 431 Mississauga Street, Niagara-on-the-Lake. +- What if I need a different kind of bike? Zoom BikeShare bikes are one size and fit riders who average 5’2 to 6’1 in height. If our BikeShare bikes are not suitable for you, our full-service bike rental & tour operation, Zoom Leisure Bikes offers a wide range of bikes at 431 Mississauga Street, Niagara-on-the-Lake. Bikes can be picked up at the store or a delivery can be arranged. Please visit our website at zoomleisure.com for more info or call 905-468-2366. +- Is Zoom BikeShare safe? Yes! We have several professional mechanics that check all of our bikes regularly. Our bikes are comfortable, easy-boarding, sturdy, and are tracked individually. The internal 7-speed gearing makes it comfortable to ride. Our bikes are equipped with kickstands, bells, and reflectors, theft proof hardware, and best of all the tires are puncture proof! Niagara is a haven to cyclists, and the region continues improving cycling infrastructure to make it safe for everyone to enjoy. Both downtown and rural Niagara-on-the-Lake have become cycling hotspots in Niagara. The Niagara River Recreation Trail/Nature Trail and the Greater Niagara Circle Route feature designated bike paths that are separate from vehicle traffic, and each year infrastructure enhancements continue to make our community more bike-friendly. Zoom BikeShare and Zoom Leisure are proud to assist local governments in improving bike infrastructure and bike safety by providing anonymous data on bike usage. +- How did you choose your Zoom Locations? Many different criteria went into choosing our current Zoom BikeShare locations. Our sister company, Zoom Leisure Bikes has ongoing partnerships with many of our current BikeShare locations that enabled a smooth transition to a sharing system. When choosing locations we consider many factors including geographic location in relation to other Zoom Locations, local destination activities, parking, access to other forms of transportation like shuttles and buses, and access to bike infrastructure. +- I would like Zoom BikeShare bikes at my property. How can I join the Zoom BikeShare network? We would love to hear from you. We are planning to expand our network of locations throughout the Niagara Region in the coming years. Please contact us at info@zoombikeshare.com or call 905-468-3401. +- What is the cost to use a bike? Our Hourly Plan is great for everyone! The cost is $5 always. +- What is the Wallet? On the first bike rental you will be prompted to add funds to your wallet. A minimum of $50 is required to get started. This amount will be used towards all your rentals at a rate of $5 per hour per bike. If the balance in the wallet is depleted you will be prompted to add more funds. Any remaining balance at the end of your rental will stay on the APP for use at a later date. If you would like the balance of your wallet refunded to you please contact us through support in the app and we are happy to do this for you. +- I don’t have a credit card. Can I still rent? Use of a credit card provides a security function in the rental process, so at this time a credit card is required for all rentals. All major credit cards are accepted. Don't have a credit card? You can rent a bike from us at Zoom Leisure at 431 Mississauga Street, Niagara-on-the-Lake and pay with debit or cash. +- What is the replacement cost of a lost or stolen bike while in my possession? The replacement cost of a Zoom BikeShare bike is $1,000 CDN. When you properly lock up your bike at a Zoom BikeShare Location and end your rental, the bike is no longer your responsibility. If your bike is stolen during a rental you are required to file a police report and contact Zoom BikeShare as soon as possible by calling 905-468-3401. +- Can I get a receipt? At the end of each rental, a receipt will automatically be emailed to the email address associated with your Zoom BikeShare account. Additionally, you can view your rental history in the app menu in the top left hand corner of the screen. +- What happens if I don’t return the bike a Zoom BikeShare Location? In order to trigger a successful ‘end’ of your bike rental and end billing time, the bike must be returned to a designated Zoom BikeShare Location. The bike can be locked within a 20 ft. radius of the bike rack and still be successfully returned. It can still be returned if all the cables are full. Bikes left outside of a designated area are considered your responsibility until returned to a Zoom Location and will be billed accordingly. If you would like to arrange a custom pick up this can be done by calling us at 905-468-3401. Pick up charges will apply for this extra service. +- Can I take out more than one bike at a time? Yes! One person can rent up to 4 bikes at one time on the same smartphone. +- What do I do if the bike needs repair? If you discover an issue with a bike, please report the problem through your app menu by using the Report a Problem link. Alternatively, please call customer service at 905-468-3401 or email us at info@zoombikeshare.com. © Copyright 2019 Zoom Bikeshare. All rights reserved.